Creative association «Society Of Spectacle (Sight)» deals with avant-garde, radical or marginal art, and also in many ways based on traditions of situationism, Russian trans-rational (zaum’) art and poetry. The main part of the «Society Of Spectacle» is rock-band with the same name. In their art issues – music recordings, literature, audio-books, book-art and show performances «Society» declared conception of new art – the art of «debilism» («moronity»), «radical radicalism», «frommushroomism» (improvisation in a moment of track recording; from Russian «Ot griba» - «From mushroom» - not in narcotic mention!) - partly near to modern concepts da-da and freak-art). «The Society Of Spectacle» (Russian abbreviation «OZ», English «S.O.S.»). Usually on this name apply "epithets" "is musical-literary association", "the profanic conglomerate of arts", "the organization for manufacture/consumption of the phenomena", "fucken spawn", etc., but it is not absolutely exact. In the center of conception of «S.O.S.» there is a concept of Anti-Catharsis. Anti-Catharsis (as basic element of asocial mentality) is directed against a mass culture, commercialization and art-consumerism, lacks of talent and platitudes in art which as all know, discredits the art as that, and at the same time and against surrealism to keep separate from it and to show it old and crooked. Like cures like - to surpass moronity of a pop-music it is necessary to try! The «Society Of Spectacle» is founded by O. Shepelyov (writer Alexey A. Shepelyov, author of novels «Echo» (St-Petersburg : Amphora Publishers, 2003) and «Maxximum Exxtremum» (Moscow: Kislorod Publishing House, 2008), poet, doctor of philosophy – dissertation on nimpholepsia in Dostoevsky’s and Nabokov’s fiction) and O. Frolov (Alexander Frolov, musician, actionist, poet and prose writer) in Tambov, Russia, in February, 13 1997. The music genre of «OZ» works is different: it depends on the album (or single) conception. In OZ music issues there are openly parody elements, as well as serious, sometimes esoteric ones, or synthesis both of them. It is from «near-verbal» experiments (sound poetry, radio performance) and a-la folk-ballad songs to funk-core and live or electronic art-rock and industrial. The most well-known soulmate musicians: Current 93, Primus, Tiger Lillies, "Grazhdanskaya oborona" (Russian «Civil Defense»), "Kommunizm"(Russian «The Communism»), «NOM», Alexander Laertsky, Psoy Korolenko, Korn, Ministry, Laibach, Einsturzende Neubauten. ''''The Headmaster Of Supreme God OZiris'''' (1998, "sound poetry"). and ''''From MOST BIGGEST Mushroom '''' (1998, ultra radical moronity). Literature: the result of over two years working – a book ('''' book '''' as a genre!) '''' Car Service Station ''''Jesus Christ'''' and other creatures of O. Korobkov and of the similars to him'''' (1999). It is the conceptual collected masterpieces: stories, sketches, poems, essays, drawings. This is main and canonic artwork of «OZ». 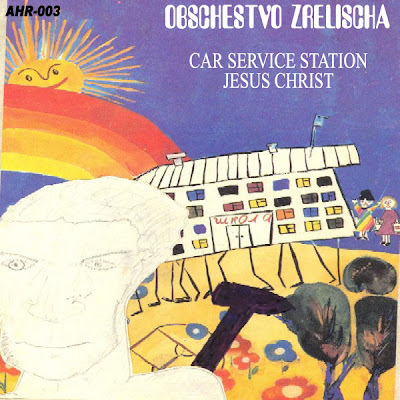 In January 2008 the second part of the book was realized by authors as a radio spectacle or audio book named «Car Service Station ''''Jesus Christ''''». Тема "Простая". Автор изображений для темы: Roofoo. Технологии Blogger.